I think it’s great that many drama schools and universities offer showreels to actors – but they have a tendency to get many key things wrong. Below I attempt to point out some of the common errors and how they can be fixed. It’s a bit like when I’d make up stories as a kid. Me and my brother would pretend we were superheroes, flying over buildings and killing lots of baddies. But if anyone had filmed us they’d have just seen two weird children running around the living room. 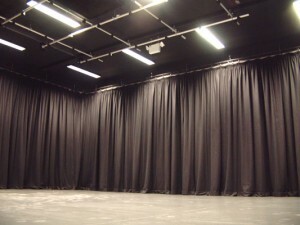 Most drama schools film their showreels in their studio spaces. This makes sense when it’s a play, because people can make believe. On screen it’s different. A character will say ‘I hate drinking alone in this bar’, but we see they are sitting in a drama studio with a black curtain behind them. When filming in a plain and boring studio, you are instantly telling the viewer that this has been created as a showreel piece. And the setting implies inexperience, it implies the actor has never done any screen work before. On the one hand, great! It shows actors pro-actively learning their craft while completing their courses, but that’s the best that will be thought of you. The whole point of a showreel scene, of any scene at all, is to make us believe in what we’re seeing. We need to want to know the story, we need to care about the characters. That won’t happen when you’re attempting a subtle, heartbreaking, kitchen break-up scene in the middle of a school stage. In theatre there is a big tradition of rehashing the same material over and over. Shakespeare has been good for thousands of years and he will be for many more. With screen work, it’s different. I would say that every third showreel I see tends to have a reworking of Patrick Marber material (for some reason people love to re-work ‘Closer’). I think doing this is a massive error of judgement and it limits an actor’s imagination. I think it is very important to use original material. A two page scene written specifically for the actors who are performing them. I’ve seen countless reattempts at Morgan Freeman’s parole board meeting in ‘Shawshank Redemption’, but what are the actors hoping to achieve? Maybe you are as good as Morgan Freeman, but re-filming one of the greatest films of all time is not the way to prove it! Re-working an already produced scene from TV or film does little to show me your skills as an actor. You’ll instantly be judged against the people who have come before you. However, seeing you in a unique, original piece, will be far more interesting to me and all casting directors. Most drama schools and many universities will now offer you a showreel as part of the course. This is a great thing – but so often the acting performances are stilted, the camerawork static. Rather than being a production, it’s a production-line, as boring as your Aunt’s wedding video, but with less natural performances. It can be very disheartening for actors who have been learning their craft for many years, to finish their courses with an embarrassingly bad showreel. It is important that schools research their filmmakers and go with people who are passionate about working with actors, who can consistently coach and encourage them to achieve great performances. So often the showreel is an afterthought, something done at the end of term. But a showreel shouldn’t be about just ticking a box. With the rise of digital media and YouTube, the showreel has become ESSENTIAL. Your headshot gives us a vague sense of what you look like, but your acting showreel shows us how you act, walk, breathe! The lack of preparation happens in many ways. At an institutional level, courses don’t give them the attention they deserve, and don’t give actors the rehearsal time they need. This is often the fault of the actors, too, who often don’t prioritise their showreels, only to realise on the shooting day how essential they are. It doesn’t take a lot to prepare — just a bit of thought from the course leaders and actors. Your showreel has a huge impact on your immediate future after graduating. 5. The Bad Combination 1, 2, 3 & 4. A scene from ‘Forrest Gump’, set in a drama studio, with shoddy, static camera-work — that is the state of so so many actor’s showreels when they finish their courses. Improving any of the above will help. A good original script sets the creative imagination of the actors free, and a well directed piece will give them confidence — and getting away from the safe zone of the school premises will do them the world of good when filming! For budget and safety purposes you may need to film the scenes on the school’s premises. In which case, be imaginative! Write scenes about teachers, lecturers, cleaners, people who break into Universities etc — work with what you’ve got! And no, don’t just recreate a scene from ‘Good Will Hunting’. Original scenes are essential. We need to see fresh actors doing fresh material. It needs to be filmed in real, believable settings, by directors who are passionate about what they do and who enjoy the process of finding great performances with actors. I am lucky to have a successful acting showreel service; but have come to realise that a huge amount of my work comes from clients who are disappointed with what they got from University/Drama school. I am now looking to be more involved in that process — to work with actors and schools to produce high quality content that will be of genuine use to graduates as they become a part of the industry. How Much Acting Training Should You Have Before Making a Showreel?